Sprawling vistas, cloistered tropical niches, breathtaking beachfront and forest hideaways make Geejam a singular highend resort experience. The sea air, the ocean sun and the balmy Caribbean breeze emote a twentyfourseven atmosphere of organic elegance, capturing that mystical spirit of the natural high, while preserving the shabby chic vibe that is intrinsic to all Island Outpost properties. A wellproportioned mix of upscale interiors matched with the intrinsic beauty of the natural environment enlivens the senses. The treated wood decks, palm treelined stone paths and groves of avocado, breadfruit, sour sop, cashew nut, plum apple and star fruit trees combine to create a Caribbean Garden of Eden in the womb of a tropical paradise. The centerpiece, which also serves as the foundational structure of the Bushbar, is composed of two three hundred yearold fig trees whose majestic sweep add a sublime scale to the already awesome indigenous landscape. 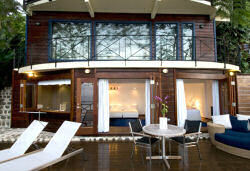 Unlike the traditional definition of a 'cabin', Geejam's deluxe brand of cabins are an exclusive feature of the estate. Strategically positioned so as to preserve all the trees and shrubbery around them in an ecofriendly fashion, their rustic, forestblending exteriors give way to luxurious modern interiors, whose digital amenities and sleek contemporary design redefine a tropical Caribbean accommodation. Ska, Mento and Rocksteady are the three unique cabins named in homage to the legacy of their respective Jamaican musical genres. The interiors are mellow, airy octangular spaces with glass doors opening onto an elevated surround sound view. As part of the community surrounds, you can occasionally hear the ambient reverb of the soundsystems rolling across the hills, or a rooster announcing the day, both of which add to the aural landscape of the property. All bathrooms are specialized according to each unit. 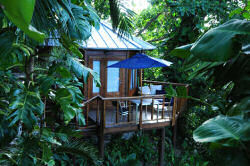 Highlighted by its lush rain forest surrounds, Mento is the ultimate nest for luxurious escape. This deluxe cabin also features an indoor bathroom with a steam room leading onto a patio, complete with a hammock for morning and evening relaxation. 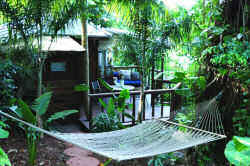 Located in a private niche, Mento fuses all the intimacy of a secluded hideaway. The cabin's high ceilings and white linens lend an atmosphere of elegant minimalism, complimented by a sweeping panoramic overlook of forest and sea from the extended veranda. 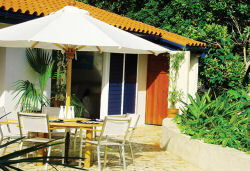 Rocksteady is just a stone's throw from both the Spa & Gym, and overlooks Geejam's own Mack Bay waterfront. The balcony is the perfect spot for morning breakfast or an evening aperitif before dinner. Rocksteady also has a double steam room, which is ideal for really sinking into your skin. 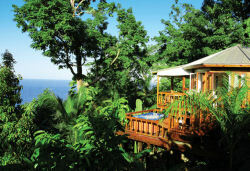 Ska boasts a deliciously situated Jacuzzi on one of its two verandas, which overlooks the forest and the ocean beyond. In addition, glass doors that can be opened for a spectacular interiortoexterior experience enclose its spacious interior. Perched on the side of the hill, Ska's location gives way to a singular view of the undulating ocean and the sprawling Jamaican horizon. A signature suite, housed on the ground floor of the recording studio, Drum & Bass is something of a music head's most farflung fantasy. Brazilian cherry wood foldout panels turn the room into a virtual outdoor veranda. Mesh sun chairs and wicker chaise lounges compliment the connecting fullscale deck. Almost a room in itself, the oversized bathroom is furnished with a steam shower and a Philippe Starck bathtub. Foldout windows give way to a heartstopping oceanic panorama. You can literally soak in the tub to the sound of the waves. Sanwood, the original villa, was designed by renowned British architect Anthony Wade in the late 1960's and is distinguished by a contemporary nautical theme. Included with the three guest rooms (SW13), are two upper deck verandas, a kitchen, outdoor pool, and media lounge, all of which provide a stylish, nextlevel living environment. The main room, doubling as a media lounge, and featuring an audio/visual library and a private photographic and pop art collection from the likes of Geejam aficionados Banksy and Juergen Teller amongst others, is a place to work, play or recharge in the company of likeminded globalistas.